I think preparing stash is one of the best gift you can give yourself on busy days.. And if you have a little one at home, you better have a lot of stash - prepare them whenever possible, so you don't have to stare at an empty fridge or pantry when you are running on zero fuel!! Yesterday, Manu had to leave early to office - gave me enough lone time to prepare a few sandwiches for myself and stash them.. And the rest of the veggies became a salad stash which I consumed peacefully with some ranch later on in the day.. I love journal entries that look so professional and nice. Great job on yours. 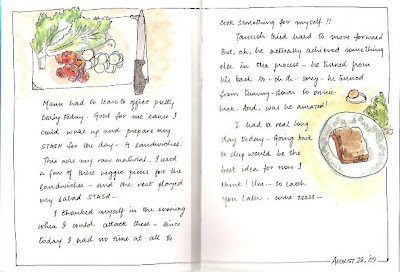 Wonderful journal pages - love your drawings!